RH (formerly Restoration Hardware) is an American home-furnishings company headquartered in Corte Madera, California. The company sells its merchandise through its retail stores, catalog, and online. As of August, 2018, the company operated a total of 70 galleries, 18 full line design galleries, and 6 baby & child galleries. The company also has 36 outlet stores in the United States and Canada. 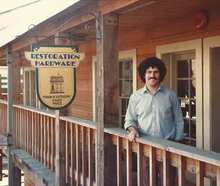 Stephen Gordon, founder of Restoration Hardware at the original Eureka, CA headquarters in 1981. Stephen Gordon founded Restoration Hardware in Eureka, CA in 1979 while restoring a Victorian home and finding affordable, high-quality hardware and fixtures unavailable. Mr. Gordon honed his merchandising skills for ten years expanding slowly in Northern California and Boston before raising outside capital from Cardinal Investments allowing accelerated expansion. The company had 47 stores when it went public in 1998, ending the year at over 65 stores and commencing a rapid expansion to over 100 stores in 31 states reaching $369.5 million in net sales by 2001. Gary Friedman joined the company from Williams-Sonoma in 2001 as Chief Executive Officer after being passed over for the CEO position at Williams-Sonoma by Howard Lester when Restoration Hardware's sales were waning and the company was seeking additional capital. In 2005, Gordon left the company in order to take over as CEO of Robert Redford's Sundance Catalog Company. In 2007, Sears Holdings Corporation announced the purchase of a 13.7% share of Restoration Hardware, prompting speculation that Sears Holdings might attempt a full takeover. After the bursting of the United States housing bubble, the company was slated to close two stores in 2008 including the original store located in the heart of Old Town Eureka., and open one in Canada. In June 2008, the company completed the transaction without Sears Holding, but instead with Catterton Partners. As of June 18, 2008, the company was no longer publicly traded. That year, the company also launched its baby & child line. In 2012, Restoration Hardware underwent an initial public offering trading at $24 a share at its opening. Restoration Hardware Holdings, Inc.'s common stock now trades on the New York Stock Exchange under the symbol RH. Upon this move the company renamed itself RH, removing the rest of the company name's letters from its official nomenclature. About 65% of the company's products come from overseas, particularly from contract manufacturers in southern China. The company is also the largest importer of Belgian Linen and Italian bedding in the United States. RH created a small spaces line in 2012, composed of furnishings scaled down for smaller living spaces. The 2014 Small Spaces source book depicts 18 different smaller-scale homes in the United States and Europe. In 2013, RH also released the Objects of Curiosity source book, showing character pieces, artifacts, and unique décor. The tableware line was released in 2013. In 2012, the company also encountered some accusations of copying the designs of other companies, specifically those used for the US military. 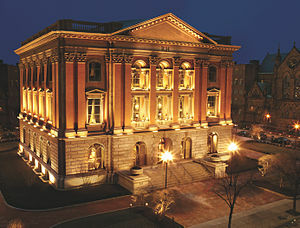 On March 7, 2013, Restoration Hardware opened a gallery in Boston's Back Bay in an 1864 brick and brownstone structure at 234 Berkeley Street. In May 2013, the company announced a multichannel RH contemporary art platform when it acquired the first edition of Rain Room by Random International with exclusive showing rights in North America. RH loaned Rain Room to the Museum of Modern Art in New York for the U.S. premier or EXPO 1: New York from mid-May through July 2013. In 2014, RH opened a 70,000 square foot store which Atlanta Magazine called RH’s “next-generation full-line design gallery”, which includes amenities like a 50-foot infinite pool. RH operates six stores in Canada: one full line design gallery at Yorkdale Shopping Centre in Toronto, three galleries and two outlets. Time magazine was critical of the company for its large catalog called the "Source Book" for its length (992 pages), specifically its waste of paper. The full 2014 catalogue weighed 17 lbs and had over 3000 pages. The company stated that by combining all of the different sourcebooks into one package it reduced their carbon footprint, while critics still stated that the volume of paper used for the publication's mass delivery was wasteful. As of September 2010, company representatives declared a change in focus for the company. In an attempt to go further "up-market", the company has focused itself on furniture gallery offerings at higher price points to distinguish itself from competitors like Pottery Barn. Locations have begun adding the term "Gallery" to their marques to indicate the change. The company designs, markets, and sells its collections through its retail stores, source books, and online. The San Francisco Chronicle has reported that, "One of the key strategies that set RH apart is its approach to inventory. While most retailers design things in-house, RH created a different model. "We have one full-time designer, Suzi Bolognese, working directly from London on our catalogs and displays" [its CEO] Friedman said. "We find artists we love and 'curate' [the client]."" The company has partnered with artisans and designers in the production of its lines. Jim Cramer of CNBC stated that source books were a tactic to move past the “four walls of the web” and to make it “exciting for people to shop again”. He also stated that RH is a market disruptor, often to the point that it “disrupts itself”. In a different piece, Cramer stated that the company was reinventing the concept of the brick and mortar store, including the use of very large flagship stores in unusual locations. Gary Friedman was the company's chairman and co-chief executive officer from 2001 until his resignation in 2012 following an independent report from Weil, Gotshal & Manges into his inappropriate romantic relationship with a younger female employee. Following his dismissal, Friedman continued the relationship with the woman. He was reappointed as co-CEO and chairman in July 2013. The company also announced that concurrent with Mr. Friedman’s appointment, RH acquired the exclusive right to develop Hierarchy and that the new concept would be rebranded as RH Atelier, focusing on the development of luxury apparel, accessories, footwear, and jewelry. Carlos Alberini joined as co-CEO in 2010, but resigned in 2013 to accept a position as CEO of Lucky Brand Jeans, upon which Friedman became the Chairman and CEO of the company..
^ "LogMeIn and Bioverativ Set to Join the S&P MidCap 400; Others to Join S&P SmallCap 600" (PDF). January 24, 2017. Retrieved February 6, 2017. ^ "Business News Briefs: Week of July 15, 2013". North Bay Business Journal. July 15, 2013. Retrieved February 18, 2014. ^ "Restoration Hardware Holdings, Inc. (RH)". Business Wire. Retrieved September 8, 2017. ^ "SEC profile: Restoration Hardware Holdings". SEC. Retrieved January 30, 2015. ^ "Career". RestorationHardware.com. Retrieved June 29, 2012. ^ "The New Yorker Digital Edition : Jan 25, 1999". archives.newyorker.com. Retrieved 2016-04-06. ^ "Still seeking to restore its health - San Francisco Business Times". San Francisco Business Times. Retrieved 2016-04-06. ^ "ACI Capital - News". www.acicapital.com. Retrieved 2016-04-06. ^ Sarker, Pia (November 20, 2007). "Sears Eyes Restoration Hardware". TheStreet.com. Archived from the original on October 2, 2012. Retrieved August 17, 2012. ^ ABIGAIL GOLDMAN (March 23, 2001). "Restoration Hardware's New CEO Says He'll Retool Home Store Chain". Los Angeles Times. Retrieved February 18, 2014. ^ "Restoration Hardware Completes Sale to Catterton Partners". Restoration Hardware (via PR Newswire). June 17, 2008. Retrieved August 17, 2012. ^ a b "Restoration Hardware Q& A: In Recession, Chain Takes Aim at the High-End Market". washingtonpost.com. ^ JACQUELINE DOHERTY (July 27, 2013). "No Room for Error". Barrons. Retrieved February 18, 2014. ^ Chris Dieterich. "Restoration Hardware IPO Prices $124 Million Deal at $24 a Share". Wall Street Journal. Retrieved February 18, 2014. ^ Mark J. Miller (September 19, 2012). "Restoration Hardware Ditching 17 Letters in RH Rebranding". Brand Channel. Retrieved February 18, 2014. ^ David Hannon (December 13, 2007). "Restoration Hardware optimizes ocean freight bid online". Purchasing Magazine via Highbeam. Archived from the original on June 11, 2014. Retrieved February 20, 2014. ^ "A Home Furnishings Visionary Takes On High Culture" (Blog). The New York Times. 2013-10-03. ^ Kim Velsey. "Restoration Hardware Would Like To Help You Decorate That Tiny Tribcea Loft You've Been Shoehorning Yourself Into". Observer. ^ "Restoration Hardware Designs for Small Spaces". gotham-magazine.com. ^ a b Jura Koncius (24 May 2013). "Restoration Hardware hits home". Washington Post. ^ Stephanie Murg (October 2, 2012). "Emeco Sues Restoration Hardware for Copying Its Navy Chair". Media Bistroa. ^ David L. Ryan. "Restoration Hardware opens new flagship store". Boston Globe. Retrieved February 18, 2014. ^ "RH Boston Video". Retrieved February 18, 2014. ^ Janelle Zara (May 16, 2013). ""Rain Room" at MoMA Heralds Restoration Hardware's Bold Move Into Art Sales Biz". Blouin Art Info. Retrieved February 18, 2014. ^ Renee Frojo (November 8, 2013). "Restoration Hardware moves into the art business". San Francisco Business Times. Retrieved February 18, 2014. ^ "The RH Factor". hfnmag.com. ^ Brad Tuttle (September 19, 2012). "What Was Restoration Hardware Thinking Putting Out a 992-Page Catalog?". Time. Retrieved February 18, 2014. ^ Alexia Elejade-Ruiz (June 11, 2014). "Restoration Hardware's 17-pound catalog lands with a thud". Chicago Tribune. Retrieved June 11, 2014. ^ Irwin, Tanya (September 13, 2010). "Restoration Hardware Reinvents Itself". MediaPost. Archived from the original on 2010-11-21. Retrieved August 17, 2012. ^ Julian Guthrie (October 26, 2013). "Gary Friedman: Restoration Hardware's savior has bigger plans". San Francisco Chronicle. Retrieved February 18, 2014. ^ Rob Brinkley. "RH and David Sutherland Collaborate on Outdoor Furnishings Line". Architectural Digest. ^ Sorkin, Andrew Ross (August 16, 2012). "Restoration Hardware Co-Chief Steps Down After an Inquiry". DealBook (blog of The New York Times). Retrieved August 16, 2012. ^ "Gary Friedman: Executive Profile & Biography". Businessweek. Retrieved June 19, 2012. ^ Hsu, Tiffany (July 3, 2013). "Reporter". LA Times. Retrieved 10 July 2013. ^ Richard Levick (August 22, 2010). "Executives Behaving Badly, Boards Behaving Well". Forbes. Retrieved February 24, 2014. ^ Tiffany Hsu (July 3, 2013). "Gary Friedman returns as chairman, co-CEO of Restoration Hardware". Los Angeles Times. Retrieved February 18, 2014. ^ Clark, Evan (13 December 2013). "Carlos Alberini Named Lucky Brand CEO". WWD. Retrieved 13 December 2013. ^ "Guess Inc. president Alberini joins Restoration Hardware as co-CEO". San Francisco Business Times. This page was last edited on 13 March 2019, at 15:42 (UTC).